> TEOTWAWKI Blog: SeaLine Dry Bag - Modern Haversack? 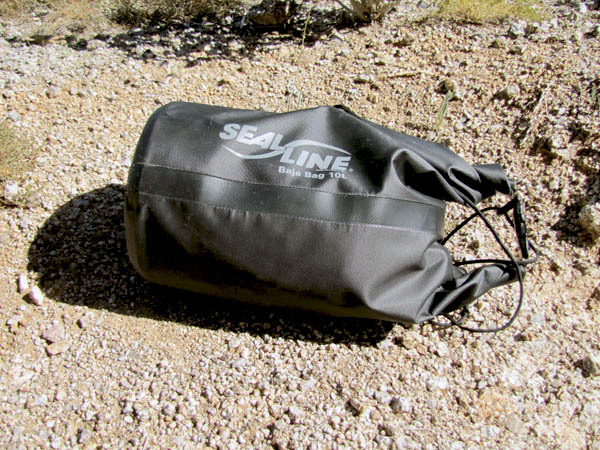 SeaLine Dry Bag - Modern Haversack? A 10L SeaLine dry sack with paracord shoulder strap. They'll also float, unless you load 'em up with exceedingly heavy stuff--lead or something similar. Filled with air, they'd certainly help you stay afloat if needed. You can smoosh out the air to compress clothes, sleeping bags, etc. in a vacuum-bag like fashion. Not as good, but certainly some added compression over a normal stuff sack. The tough vinyl offers an extra measure of protection from abrasion. You can also use it as a water container--it'll hold around 10L of water, which could be a life saver in a survival scenario. Emptied of gear and filled with air, they'll also make a decent air pillow. The bag has a single D-ring, which I've used to attach a paracord loop. This allows for haversack-style shoulder carrying.You could also use more conventional webbing material, which would be more comfortable than the simple paracord. The 10L dry sack is big enough to carry a basic survival kit like a Dave Canterbury style 10-piece kit. While a basic, shoulder-bag sized survival kit has its limitations, this is certainly an good kit to have on a short hike, scout, etc. While I prefer backpack carry in most cases, I know there are many who like shoulder bags and old-school haversacks. Due to the waterproof nature of these dry bags, I think they make a superior gear option for that kind of kit, especially if you're going to be on/near water. NOTE: The Marines are using a similar bag--a bit more high tech--called the MAC Sack, also made by SeaLine. It has a built in air purge valve to help with the compression. I don't have any first hand experience with the MAC Sack, but the reviews are very good.